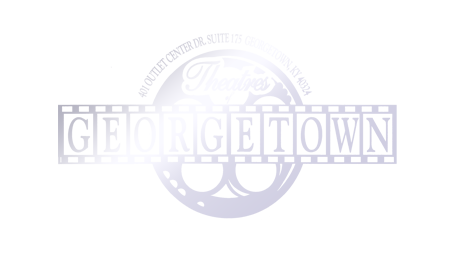 Online Ticket Purchases and Pricing and more, scoll down for more information about Theatres of Georgetown policies. Movies beging after 5:30PM General Admission- $7.50, Children (under 11), Seniors(62 and up), Students 12-17 or college students WITH current college ID - $5.00 for NON-3D movies. For 3D add $2.50 per ticket. Ticket prices may change without notice. You can pre-puchase tickets on this site at no additional charge. We hope the follow information will help you with your purchase. Please read all information before making your purchase. Step 1) Select the Showtime tab then select the date, IF the movie you are looking for is not listed, or does not open for a few weeks, change the month and date. IF tickets pre-sales have been approved by the film studios and we are going to have this movie the date will be available for you to pick. Step 2) Click on the date you want and a follow the prompts to purchase your tickets( credit card, debit card or a Theatres of Georgetown gift card may be used). Step 4) Arrive early to have your tickets printed at the Box Office. Your tickets are held in our system according to your confirmation number and last 4 digits of the card used to purchase them. How early you arrive is depending on how big a movie it is and whether it is opening weekend or not. We suggest at least 30 mins early. Step 5) Bring the confirmation email or card that you used to purchase the tickets to one of the registers and we will print your tickets. All pre-purchased tickets are final, they cannot be exchanged or refunded. Your tickets guarantee you a seat, but not necessarily seats together. On opening weekend, we advise arriving 30 mins. early. Yes, Visa, Mastercard, Discover and Pay Pal. We do not allow large bags, back packs, large diaper bags, strollers, pets nor computers within the individual theatres- this was put in place after the GPD and SCSD suggested it and the film companies ask this be policy. Sorry for any inconviencence. All of our staff goes through safety proceedures 3 times a year for fire emergencies, medical emergencies and dangerous situtations. We at Theatres of Georgetown try to make sure that all patrons have a safe and enjoyable visit to the theatres. To this end, we sometimes have to ask our patrons to put away phones, walk rather than run, and not climb on benches and more. But if we ask you or your children to alter behavior, it is for the safety and enjoyment of all patrons. Thank you! We at Theatres of Georgetown desire to show all the new titles opening each week; however, we do not have the option to select all the movies. Film companies offer titles to theatres using several criterias. The 2 top are how movies of that type have done in the past and the size of theatre or community. Our coming soon section on this page is simply titles that are being released by the film companies. We are happy to forward any request of upcoming movies to the apporiate channels for consideration.